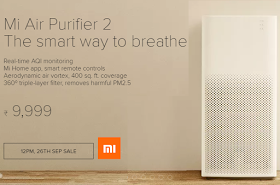 Mi Air Purifier 2 is simple, elegant and has a new compact design that is 40% smaller than the first Mi Air Purifier. Despite this, it still offers a high 310m3/h Clean Air Delivery Rate (CADR) ② and takes just 10 minutes to circulate purified air in a 21m2 room. √That's it! Your Order is placed & will be delivered within Few days.